When it comes to creating a great physique, proportions and symmetry are necessary. A “V-taper” is described as big shoulders and wide lats leading to a tight waist, a feature made most popular in the earlier days of bodybuilding. Shoulders play a crucial role in the V-taper. Wide, broad shoulders will create the wider upper body that leads to the waist. Wider shoulders will also create the illusion of a smaller waist, which is key. In order to train the shoulders to enhance the V-taper, a certain focus should be given to the lateral head of the delts. The lateral delts contribute not only to the roundness of the shoulders, but to the width of the highest point in your frame. For any given shoulder workout, I like to start with a seated shoulder press. Whether dumbbell, barbell or machine, starting with a press is a great way to warm up all the heads of the deltoid. When pressing, I like to use the 10 to 12 rep range after warming up. Go heavy, but remember to keep proper form. Along with presses, try doing upright rows as well. I usually go with a lighter weight to really squeeze the muscles at the top of the movement and cut down on momentum. With the upright rows, try placing your hands wider on the bar to have more of an emphasis on the delts. I always like to shoulder press and upright row first, when my muscles are fresh, and then switch to raises to really fatigue the delts. Once your shoulders are pumped from presses and upright rows, it’s time to raise. Lateral raises are a staple for any shoulder workout. Lateral raises focus on the medial shoulder, which increases the width of your frame when viewed from the front. Keep in mind that with the V-taper, the wider your frame is, the smaller your waist will look. When performing raises of any variation, I like to keep the reps high. This is to really keep the muscles under constant tension and squeeze them in a controlled manner. Adding front and rear delt raises will not only create a rounder shoulder, but will also push the medial delt out further. 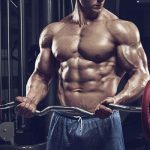 Don’t forget that when working on building a better V-taper, wide shoulders are going to really create that look. There’s nothing wrong with throwing a few extra sets of lateral raises on your shoulder day. Also, don’t be afraid to throw in variations to mix things up. Whether it’s the angle of your body or wrists, try it! You just might like it and you’ll grow in the process.